Boats landed in DRC's coast are exacerbating the shore erosion by displacing sand from the beach. On Africa’s West Coast, the ocean is everything. For thousands of years, its bounty has provided food for families, employment for fisherfolk, remarkable sunsets that attract tourists, ports that carry goods and build economic resilience, and coastal barriers that buffer the earth, cleanse the ocean and create a more sustainable ecosystem. The ocean is hearth and home. But changes in the climate are resulting in rising sea levels, degraded fish stocks, coastal degradation and more. Making this both an ocean of fortune and an ocean of peril. Taking it from a broad optic, the coastal zone of West Africa represents a major source of revenues for its communities. In some countries, like Senegal, 66% of the population lives in coastal areas. In addition, due to high population growth and the decreased productivity of agricultural lands in the coastal zones – caused in particular by an increased salinization of the soils – coastal communities are under ever-greater pressure and are increasingly dependent on ocean resources for their survival. This results in intensive unsustainable fishing close to the coastal zones where fish reproduce, as well as sand displacement resulting from the ever-growing fleets of fishing boats that land on the shore. Mangrove and other natural buffers are cut down for firewood, and the construction sector mines the sand to build new houses for a growing population. In short, there are stresses on every side of the ecosystem and economy. In addition to the unsustainable human-induced pressures depleting these resources (especially fish populations), climate change is putting an additional stress on livelihoods in coastal communities. 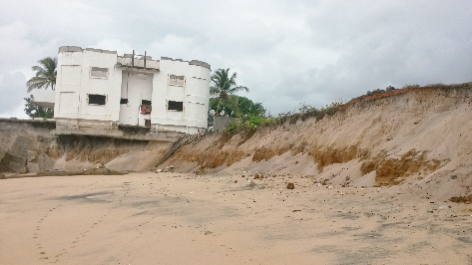 The Democratic Republic of the Congo (DRC) is witnessing unprecedented rates of erosion on its 40km sliver of coast. Recent estimates indicate that 15 meters of coastline has already been lost over the past 10 years. On a mission there this March, the connection between local communities, poverty traps and rising seas became readily apparent. In certain areas, large colonial homes that were built 100 years ago are now slipping into the sea. Erosion here happens due to a combination of factors, including the low topography of the coastal area, the gritty nature of the rock, but most importantly the increased impact of sea level rise. This erosion means infrastructure and valuable assets can be wiped out, and salt water can intrude on agricultural lands, cutting economic productivity for this least developed country. On a global level, climate change impacts are at the heart of international discussions, afternoon talk shows and everyday conversations. While the reality of climate change is a consensual fact, doubts are being raised with greater force and greater resonance every day. Unfortunately, in this global conversation, all too often the voices of vulnerable coastal communities are left unheard. In Africa myriad stresses – from war to famine to disease to resource depletion – pull at resources and threaten peaceful and prosperous achievement of the 2030 Agenda for Sustainable Development, with little attention paid to the impacts sea-level rise will have on economic development. On my last mission to DRC, a local villager from the coastal town of Nsiamfumu, Muanda, underlined the true impact rising seas and coastal degradation are having on the community. “Our ancestors brought us in coastal areas to exploit the resources the ocean offers, but with the increasing impacts of climate change and the threats it poses on our families and our livelihoods, we are forced to retreat inland and leave our ancestor’s lands.” These modern-day climate refuges will strain national resources and face new perils on their inland journey. Among the various projects UNDP supports to address the challenges posed by climate change in Africa’s coastal areas, the Strengthening Resilience of Muanda’s communities from coastal erosion in the Democratic Republic of Congo project is providing a comprehensive and sustainable approach to support vulnerable communities in their efforts to adapt to climate change. Financed through the Global Environment Facility’s Least Developed Countries Fund (GEF-LDCF) with US$5.3 million in grant funding, the project will be a centerpiece in the nation’s efforts to protect its coasts. By collecting climate data and translating it into usable and understandable information, the project will enable decision-makers to plan and budget for climate change and provide communities with the necessary climate information and early warnings they need to prepare in case of extreme weather. Local communities will be directly supported by investments in coastal defence, including the introduction of pilot adaptation measures to stabilize the cliffs at Muanda and secure fisherman docking and landing operations at Nsiamfumu. In addition, the project will create alternative Income Generating Activities (IGA) for women and youth organizations to reduce pressure on coastal resources and uplift the economic status of these at-risk groups. More specifically, processing of fish, fruit-based products, poultry, mushroom farming, honey production, artisanal craft, oyster cultures in mangrove areas and resilient small-scale farming practices will be promoted to provide an incentive to sustainably divert from unsustainable practices. In the end, the ocean has always abided. Whether it will be an ocean of fortune, that protects and nurtures the vulnerable people of DRC, or an ocean of peril, where rising tides force migration, perpetuate poverty traps and diminish stability-building efforts, remains to be seen. But with sustained support, and active engagement with at-risk coastal communities, the chances of building an ocean of fortune remain high. A shortened version of this blog originally appeared on the UNDP Blog in the run up to the Ocean Conference in June. 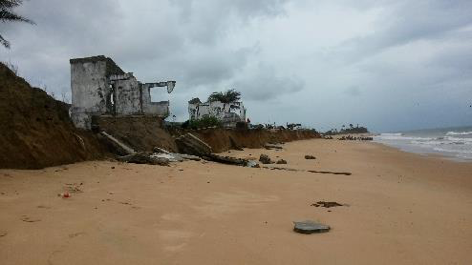 Image caption: Coastal zone retreat is eating-up infrastructure in Sierra Leone. Clotilde Goeman is a Regional Technical Advisor for Climate Change Adaptation and International Waters in Central and West Africa for UNDP. Follow her on twitter @clotilde_goeman.